A little about me, where to start?! Around four years ago I decided to step out on my own and go self-employed. Well there couldn't have been a better outcome as I am now Yard Manager of Burnby Equestrian Centre. I am currently based at this lovely yard at the foot of the Wolds where I coach a range of riders from beginners through to the competitive rider. I also offer my skills as a Freelance Instructor/Rider/Coach, specialising in work with young and green horses during the week. 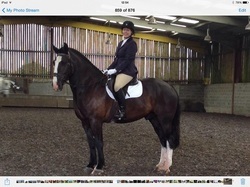 By combining schooling the horse with teaching the rider I am able to help people who are struggling with their own horse and develop them together as a team to achieve their goals. My specialty has to be working with nervous horses and owners. I have helped many riders work through their fears, whether its a simple mounting problem or a worry whilst hacking out. I work with the rider and horse to combat the nerves through a combination of riding the horse myself and then handing the reins back to the owner for that all important break through moment. In the past I have worked on various yards, including work in Racing, Hunting and Riding Schools. Unusually I have not always worked with horses, they have always been an obsession, but I wasn’t lucky enough to call them “work” until a few years ago! I have owned horses for many years and completed BHS Stage 1 as a horse owner. I have most recently gained the UK Certificate in Coaching Level 2, which includes the Preliminary Teaching Qualification through the British Horse Society and I aim to carry on up the ranks! So before horses and after completing a degree in Sociology I worked in Payroll, which was a very interesting job however not where I was destined to be. After many hours of volunteering in the horse industry I was employed by the Senior Master of the Pytchley Hunt, in Northamptonshire! Here I learnt a great deal on how to build fitness and how to meet exacting standards of upkeep, both with the horses and with the yard itself. Unfortunately this job came to an end, due to changing needs of the yard. At this point I decided to move back to Yorkshire and managed to secure a job in racing! I worked for a small racing yard with a great trainer and had the opportunity to visit many races, including the John Smiths Cup at York racecourse. Again I learnt an invaluable amount of knowledge about the upkeep, training and care of horses. In 2012 I decided to go it alone as a self-employed Rider and Instructor. Over the last four years I have worked with some fantastic clients, progressed some great horses and made some real breakthroughs. Here are a few thoughts from my clients. "Felicity has been helping me for over a year now. She has enabled me to grow in confidence and make that all important bond with my horse, Dylan. She is professional, friendly, reliable and knowledgeable. After seeing Felicity compete Dylan in dressage, I now have the self belief to give it a go. I have gone from being cautious to a much more positive rider and am now really enjoying owning my own horse"
"A bit of a miracle happened this morning - he was a horror for 10 mins, but I got through it and then he gave up and neither of us were scared"